My bestseller list is dominated every week by Young Adult books with a significant sprinkling of middle grade books. Picture books tend to shine primarily in the "Kids" section of Barnes and Noble, the since the color Nook works to their advantage. 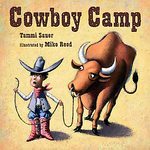 On my list from March 4th, Tammi Sauer's book Cowboy Camp hit the B and N number 4 spot so I contacted her to learn about her e-book experience. Tell us about Cowboy Camp -- what's the story? Avery arrives at Cowboy Camp and discovers he’s all wrong and he can’t do anything right. He’s even—gasp!—allergic to horses. But, when bad guy Black Bart shows up and tries to put a stop to Cowboy Camp, Avery proves his mettle and is hailed a real cowboy. The target audience for Cowboy Camp is four to eight year olds. While I believe nothing can replace the experience of sharing a traditional book with a child (the coziness, the smell and feel of a book, the turn of the pages…), I think the e-format has a lot to offer. Three perks of the e-format, for instance, are that this version is cheaper, portable, and convenient. Is your book available in print format? Which came first and why? How do your sales compare between the two formats? Cowboy Camp is available in print format as well. The traditional print version of Cowboy Camp debuted in 2005 which was well before the e-format craze. The print format of the book continues to sell well. It’s too early to make a comparison between the two formats since the e-format only came out in fall 2010. Tell us briefly about your path to publication. All of my books are with traditional publishers. Cowboy Camp was my first book, and it was discovered in the slush pile. Since then I have sold eight others. I write so that children can experience the joy and wonder found in books. The more formats that are available, the more children can be reached. Tammi Sauer has sold nine picture books to a number of major publishing houses: Bloomsbury, Houghton Mifflin Harcourt, Simon & Schuster, and Sterling. One of her latest books, Chicken Dance, received the 2010 Oklahoma Book Award and the 2009 NAPPA Gold Medal Award. It was named a 2009 ABC Best Books for Children and a 2010 Chicago Public Library’s Best of the Best book. This book was also recently released in French which makes her feel extra fancy. 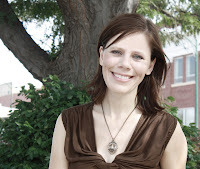 Learn more about Tammi at her website.